The finance and tech industries have been the whipping boys for American inequality. Lie in their junction are the algorithm traders. A specific form of algorithm trading, with high frequency as depicted in this book, is to arbitrage the time differentials between signals traveling through different electronic routes. For example, say you want to buy or sell a block of stocks too large for any single exchange to fulfill. Your order is then broken down into smaller blocks, each routed to a different exchange. A high frequency trader, by placing small orders for all stocks in all exchanges all the time, like a fisherman placing baits, can detect your order arriving in the first exchange, and quickly insert itself as the counter party of all your other orders arriving later in other exchanges. This allows the trader to make a small amount profit multiplied by a very large number of trades. In order to pull this off, a high frequency trader has to be on the frontier of high performance computing. 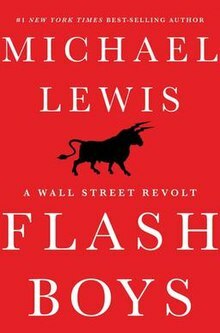 This is a highly entertaining read like many of Michael Lewis’ previous books. But the distinction is not all that clear between the narrated protagonists and antagonists, who are all wealthy financiers. If the incarceration experience doesn’t break your spirit, it changes you in a way that you lose many fears. You begin to realize that your life is not ruled by your ego and ambition and that it can end any day at any time. So why worry?